Are you looking for luxury ready to wear manufacturers that can provide small quantities for your luxury brand. If you like to source your garment manufacturing requirements in India. We can help you. Purnima Exports as being manufacturer for various leading designers and high end store can achieve the level of quality and workmanship which you are looking for. We take pride in manufacturing high quality designer garments using traditional Craftsmanship with modern look. We are so confident with our quality that you can utilise our production services to manufacture any type of garment. We also understand the importance of consistent quality, hence we have good team of Patterns cutters, Tailors, Merchandisers, Embroidery staff, Quality Controller, Finishing and packing team having good experience in there fields. Purnima Bansal who is creative director of the company has wide experience working with top brands such as Frank Ushers, Debenhums, American Style, etc. as there representative Fashion Designer, Quality Controller managing all operations before starting her own export house. Since then there has been no looking back. 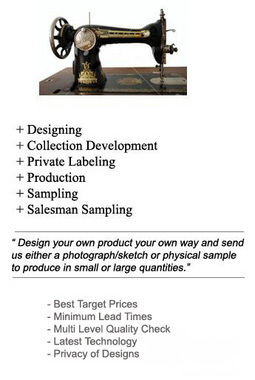 We are connected with some leading designers and brands fulfilling there production and sampling needs. We are also developing various collection for designers every year. Purnima exports have 25 years experience in garment production, sourcing and design development in collaboration with designer labels. Having built from the ground up our own quality in house production facility and happy to offer production service to other small businesses looking for reliable supplier. We understand the challenges of managing small quantity production and will consult and assist clients throughout the whole garment process. Our workshop is open to anyone interested in high quality sampling and production runs in any sizes. We are a family managed business and self funded with single ownership hence each client is treated personally. The Garment Factory is located in New Delhi, India with permanent staff of 25 with capacity to increase according to demand. There is no minimum quantity policy. We would be happy to consider 1 piece also for medium sized production. Purnima Exports offers competitive prices and aims ro work closely with clients on a CMT ( cut, make and Trim ) Basis as well as full production basis. For Small runs we are happy to offer Pattern Making Services at additional cost. If we work on CMT we ask all clients to provide their patterns, fabrics, trims and a garment pack with the information needed for the factory to work and provide you an accurate quote per style. We make Knitted, Woven Garments as well as Fashion Accessories. We specialise in Hand and Machine embroideries, hand beading. We also have provision for Computerised embroideries for large productions. We are happy to consider order of any quantity. Prices will be dependent on style and quantity. All styles will be discussed in details with clients before prices are confirmed. 1-2000 pcs dependant on style. Our workshop & studio is based in New Delhi, India . Purnima Exports work on a FOB basis (Freight On Board) We can help you with all your shipping documents and upon request, will deliver your goods to your nominated shipper. We will advise the client of the shipping ref and it is up to the client to collect the goods once it reaches its destination. All cost of duty and taxes are the responsibility of the client. We also have tie-ups with DHL, ARAMEX & UPS for delivery of goods door to door. We get competitive rates from them. We also use Local delivery services which are bit cheaper and you need to collect the goods once it reaches the destination. We are happy to quote on lead times once we have spoken and received a garment pack from the client. We take great care in our workers welfare and are proud to say we are a small yet happy family. Happy workers equal happy clients.